Amélie is an astonishing young woman who lives quietly in the world, but loudly in her imagination. She secretly improvises small, but extraordinary acts of kindness that bring happiness to those around her. But when a chance at love comes her way, Amélie will have to risk everything to say what’s in her heart. Based on the much loved and five-time Oscar nominated film, Amélie is a feel good musical filled to the brim with colourful observations and whimsical wonderings. 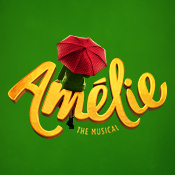 Join Amélie as she finds her voice, discovers the power of connection, and sees possibility around every corner.